Great, we are already here waiting for you. So that the landing in the Desert Ashram will be soft and easy, we wrote for you the ten tips that will bring a smile to your face. 1. Come open to meditation. It’s a life changing experience. It will focus you, centralize you and liberate you. It's turning the focus inward. Yes, even at 6 thirty in the morning, be total in the meditation. Come with comfortable clothing so you can jump and dance. Oh yeah, and with clothes you wouldn't mind to stain in colors, chocolate, glue and many others materials. 2. Come open to work. Work is part of our lives, in the Ashram and outside. 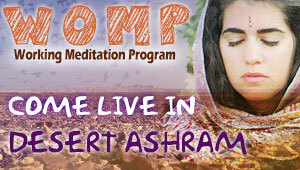 In the Ashram you are invited to find out that work, even the simplest, can be fun! With good company, guidance, and intention to work in meditation, you are welcome to find that you aren't lazy/workaholic/ irresponsible/over achiever, like you always have been told. 3. Come from self love and a true wish to know and strengthen yourself, and of course to share your wonders with us. 4. Come with patience and be prepared for everything. Part of the reason that we invite you to a minimum of 10 days of WOMP is so you can go through a process that you can breathe in. In such a process there are a variety of moments. Some are full with new insights and pure happiness, and some full with frustration and even pain. Take it with love and as part of your processes and you will be thankful for the lessons. 5. Come open for change inside and outside. For that you are coming right? Be ready for different kinds of conversations and all different types of experiences. Be ready for the transformation that will happen in your life story and even your plans. 6. Come open to get closer. The special community life of the Desert Ashram reveals the great power of sharing and connection to other people. The secret of Desert Ashram is in the unique people that the place is attracting and offering space to be themselves. The people around us, like Osho says, are our mirrors – and what a beautiful sight you can see if you just look around. So come ready to fall in love in many ways. 7. Come with your inner child. There isn't a better place to be a kid than in the Desert Ashram. Climb on trees, spread fairy dust, dance and sing. The Ashram is the perfect place to be the child that is inside of you, the child that we most of the time need to hide. The WOMP program allows you to celebrate yourself and the child inside you! Bring with you your loved music (because music is part of our lives here), an instrument, a note book and a pen, colors, art materials and all that you enjoy doing. You may not have a lot of time, because the program is pretty busy sometimes and full of friends. But if this is who you are, go for it. 8. Come open to learn. The community life in the Ashram, like many other small communities around the world is an alternative way of life, we invite you to come and learn about different ways of living. 9. Come without expectation. Expectations are fictions that exist in our minds and we become disappointed if things don’t go exactly as we thought it would. Come with intention to breath and go with the flow – everything else will happen on its own. 10. Come without shame or ego. Our worst sin is to be ashamed of who we are. Come proud of who and what you are, and don't be afraid to be yourself in every moment. We all can learn something and we all have a lot to teach. The WOMP program reminds you that. 11. Come. There will always be excuses. Stop for one moment the race you are in and do something just for yourself, you deserve it. So come on, we are waiting for you. From our guests we will ask you not to bring a gas grill (to light a fire is strictly prohibited), meat (also tuna fish is meat) and animals including dogs to the Desert Ashram.